Oftentimes, skin irritations and rashes are lumped together and treated the same way when actually they are often completely different issues. Many people confuse eczema and psoriasis, two different skin conditions that can sometimes include similar symptoms. Dr. Joel Schlessinger is here to explain the differences between these two conditions. Eczema, explains Dr. Joel Schlessinger, is also known as atopic dermatitis. Eczema is extremely common in children and infants and about one percent of adults also experience this issue. Eczema is an inflammation of the skin that results in a dry, itchy rash that usually appears on the face, backs of the knees and elbows. While the cause of this condition is unknown, individuals with allergies, asthma or hay fever may be more susceptible to it. Topical treatment products are the most effective way to treat eczema. Dr. Joel Schlessinger and his son Daniel created FixMySkin Healing Balm with 1% Hydrocortisone to heal irritating dry skin conditions such as eczema. Certain skin care ingredients such as fragrances, chemicals and dyes can trigger eczema flare-ups so knowing what aggravates your eczema will help you keep it under control. Psoriasis is an autoimmune disease that affects the skin, says Dr. Joel Schlessinger. 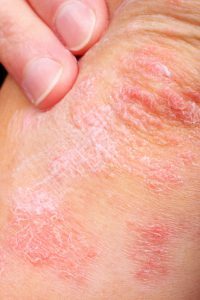 When an individual has psoriasis and the skin becomes inflamed and the body overreacts to the damage by becoming red and irritated and by creating dry, scaly patches of skin. The patches can crack and bleed if they are left untreated. Psoriasis can be hereditary and elements such as diet, allergies and stress can trigger the condition. There are several methods for treating psoriasis including light therapy, prescriptions and topical creams. You can apply the FixMySkin Healing Balm with 1% Hydrocortisone up to three times a day to relieve itching and irritation. It is also important to use hydrating products that are free of irritating ingredients such as dyes and fragrances. Dr. Joel Schlessinger recommends Vanicream Moisturizing Skin Cream to patients with psoriasis. Do you want to know more about the difference between eczema and psoriasis? Ask Dr. Joel Schlessinger your questions! What is combination skin? Joel Schlessinger MD tells about this commonly misdiagnosed skin condition. Skin care products are often targeted toward specific skin types. Normal, dry, oily and combination are the usual culprits – but what exactly is combination skin? Dr. Joel Schlessinger gives us his expert definition of combination skin and the best products for this special skin type. 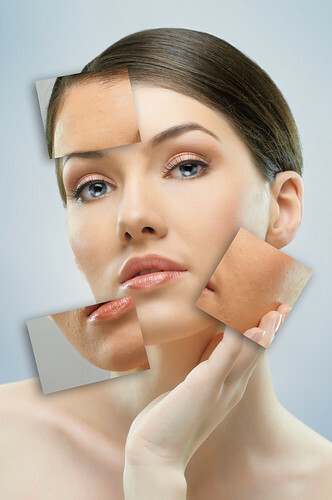 Combination skin is commonly characterized by two or more different skin types on your face at the same time. Some areas of your face may be dry or flaky while other areas are oily. Sometimes, conditions such as wrinkles and breakouts, or dry skin and rosacea occur at the same time. Dr. Joel Schlessinger recommends the use of a 1% hydrocortisone product to help heal and soothe combination skin types. He prefers the use of FixMySkin Healing Balms with 1% Hydrocortisone. “Many people assume combination skin is a form of dry skin, but it is more akin to a mild form of psoriasis than anything else. Luckily, there are good treatments for it now,” said Dr. Joel Schlessinger. If you do not see signs of improvement in your skin after using a 1% hydrocortisone product, Dr. Joel Schlessinger recommends visiting your local dermatologist. You can find FixMySkin Healing Balms with 1% Hydrocortisone at FixMySkin.com.